In 2006, Amazon reported that for every 100 milliseconds they speed up their website, they see a 1% increase in revenue. Then Google announced, in an effort to improve the web, that page speed was a consideration in how they rank search results. Since then, there’ve been no shortages of case studies showing the benefits of having a fast site. 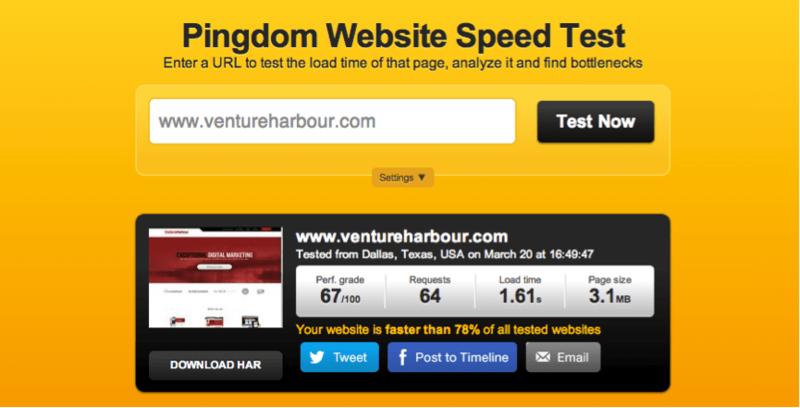 In this guide, I’ve tried to pull together everything that will enable you to improve your website’s loading speed. For a bit of fun, I also decided to test everything in this post on this site to see what impact it had. First of all, how fast is fast enough? Optimising your page speed can be a hedonic process, kind of like running on a treadmill. There will forever be room for improvement, so when should we be satisfied? So how did this site perform before I carried out everything in this post? 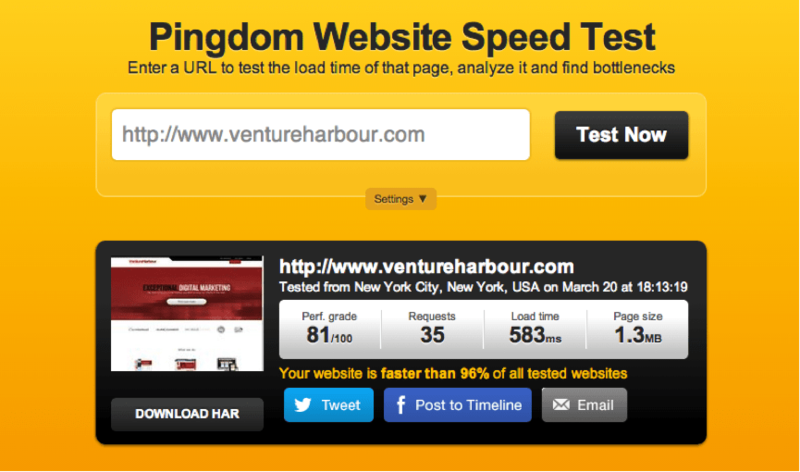 The Venture Harbour site wasn’t too bad with a page loading speed of 1.61 seconds, but clearly there was room for improvement. The home page was making 64 requests and was over 3mb, which is quite high, and largely caused by loading lots of JS files from plugins that weren’t even being used. After spending 45 minutes implementing as many of the recommendations in this post as possible, I managed to reduce our page loading speed to 583ms, reducing the page size to one third and almost halving the number of HTTP requests. All of this was done without making any changes to the visual user experience. So how can you speed up your site like this? Let’s start off with some of the things that have the biggest impact. 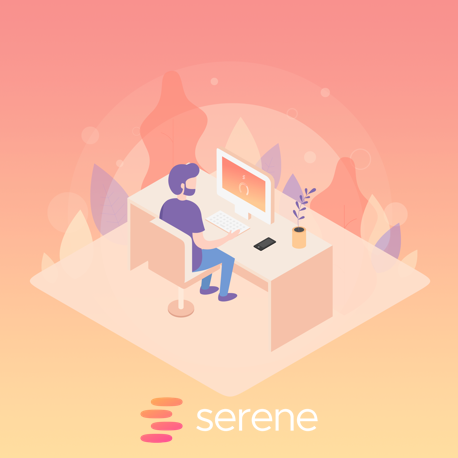 Hosting your media files on a content delivery network is one of the best ways to speed up your site, and can often save up to 60% bandwidth and halve the number of requests your website makes. CDNs work by hosting your files across a large network of servers around the World. When a user visits your site from Thailand, they are downloading files from the server that is closest to them. Because the bandwidth is spread across so many different servers, it reduces the load on any single server and also protects your sites from DDoS attacks and traffic spikes. We’ve tested a few CDNs at Venture Harbour, including MaxCDN, Cloudwatch, Static DNA and Cloudflare. Out of the bunch, Cloudflare is our favourite (and is free to get started with). While researching our guide to the best web hosting, I setup response time monitoring for a range of different web hosting companies. I simply opened an account, uploaded a blank WordPress site with an identical theme, and then used a server monitoring tool to test the response time every five minutes. 9/10 of the web hosts I tested had a response time of 600ms – 1300ms. WP Engine‘s server response time was 293ms. Yes, it’s not the cheapest web hosting solution (they start at $29/month), but it’s one of the few hosting companies that really justifies its price. In fact, if I could go back 5 years and do one thing differently it would be to start using WP Engine earlier, as it’s not just made our sites significantly faster, but the security and workflow improvements have also saved us so many headaches. Changing web hosts may not be something you can do in under 45 minutes, but it has the potential to have a bigger impact than all of the ‘tweaks’ below combined. My advice? If you’re using a mediocre or low quality web hosting company, stop reading, get started with a host like WP Engine, and come back later if you still have page speed issues. If you’re using WordPress, one of the quickest and easiest ways to cut your page loading speed is to install a caching plugin like WP Total Cache or WP Super Cache. Of course, if you are using WP Engine, you can skip this point as they have caching built-in. Both of the plugins mentioned above are free to download and very good. Despite their name, caching plugins do quite a lot beyond browser caching, although that is their primary function. I’ll discuss the benefits and how to add browser caching in a second without a plugin, but for those using WordPress and looking to improve page speed quickly, it’s often easier to just install a plugin. If you’re not using WordPress, or you would rather not install another plugin to add Expires Headers and browser caching, here’s how to implement it manually. Expires headers tell the browser whether to request a specific file from the webserver or whether to get a version of a page from the browser’s cache. Of course, this only applies if a user already has a version of your web page stored in their cache, so it will only speed up your site for users who have already visited your website. Expires headers speed up your site in two ways. First of all, they reduce the need for users to download the same files from your webserver twice. Secondly, it reduces the number of HTTP requests that need to be made, further speeding up the time it takes for the page to load. Adding Expires Headers is extremely easy. You just need to follow the instructions here to add a bit of code into your .htaccess file. Prevention is usually a better strategy than cure. To prevent lots of page speed issues in the first place, you should opt for a good host, a good CDN, and good theme/design. As a digital marketer, it’s frustrating when web designers build sites that look beautiful but perform terribly from an SEO perspective or a speed perspective. I remember once having to deliver news to a client who spent a quarter of a million pounds on a new website, only to have it scrapped because it would have obliterated their digital marketing efforts. This is the most extreme example I’ve ever experienced, but it’s etched a scar that I’ll always remember. Today, the problem is neither better nor worse than it was five years ago. Back when I started doing SEO, designers still used flash and other primitive technologies to build sites. Today, designers built WordPress themes with so many bells and whistles that it’s no wonder they take 10 seconds to load. I recently put together this huge list of responsive WordPress themes that have been designed by theme designers that have taken speed into account. When choosing a theme, if in doubt, go minimal. If you’re using WordPress, install the WP Smush.it plugin to automatically compress your images. This will reduce the size of your images without losing any visual quality. The great thing about this plugin is that it works in the background every time you upload a new image. You can also run it retrospectively on all of the images uploaded to your media library. One of the pitfalls with WordPress is that your database can get very messy very quickly due to saved drafts, post revisions, deactivated plugins etc. WP Optimize is a fantastic plugin that routinely deletes all of the stuff you don’t need that’s cluttering up your database. After running this on the Venture Harbour database I managed to reduce the database from 5mb to 3mb, which helps speed up the time it takes for the browser to collect and return files from the database. Gzip is a simple method for compressing your website’s files to save bandwidth and speed up page load times. Gzip works by compressing your files into a zip file, which is faster for the user’s browser to load. The user’s browser then unzips the file and shows the content. This method of transmitting content from the server to the browser is far more efficient, and saves a lot of time. To check whether Gzip is enabled or working properly on your site, you can use Gziptest.com. If page speed isn’t compelling enough a reason to fix your broken links, hopefully the impact on these behavioral metrics is. The reason why I recommend using all three, is because some will go deeper than others and identify crawl errors that others don’t. Once you’ve reached 0 broken links on all three tools, your job is done! While 301 (permanent) redirects are preferable to 404 errors (broken links), they’re still not ideal as they slow down the time it takes for the browser to reach the correct version of a page. Screaming Frog is once again a great tool for spotting 301 redirects. If you’re using a PC, you can also use Xenu Link Sleuth, which is a great tool for crawling data from websites. The second aspect on minifying involves deleting white space and making your files smaller. If you’re using WordPress, WP Minify is a great plugin that automatically does all of this for you. Similarly to the point above, @import uses up more resource than directly linking to your stylesheets despite achieving the exact same result. Another reason why not to use @import is that some of the older browsers do not support it, so it’s best to avoid it where possible. Pingbacks and trackbacks don’t really serve any practical use in WordPress, and yet they’re often enabled by default. I’d recommend turning both of these off as they do clog up your database and increase the number of requests that are made. HTTP Keep Alive refers to the message that’s sent between the client machine and the web server asking for permission to download a file. Enabling Keep Alive allows the client machine to download multiple files without repeatedly asking permission, which helps to save bandwidth. Before your browser can display your webpage it has to figure out how to lay out your content around your images. Without knowing the size of these images the browser work it out, causing it to work harder and take longer. For the same reason as above, it’s useful to specify a character set in your HTTP response headers, so that the browser doesn’t have to spend extra time working out which character set you’re using. You can do this by simply adding a UTF-8 character set tag in your website’ssection. When other website’s ‘hot link’ to your images it steals bandwidth, slowing your site down. To prevent other sites from hogging your bandwidth, you can add this snippet of code to your .htaccess file. Remember to change the bit that says VentureHarbour.com! 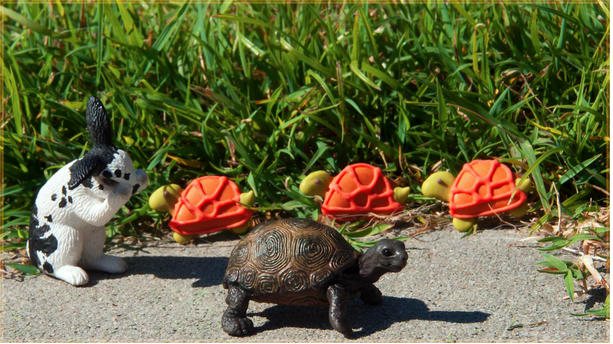 With WordPress sites, plugins are usually the biggest culprit for slowing the site down. If there are any plugins that you’re no longer using or aren’t essential, delete them. Round trip time is the time taken for the client to send a request and the server to respond. It’s affected by a huge range of things, but is primarily impacted by the number of requests that are being sent. As shown in the Pingdom screenshots at the top of this post, I managed to almost halve the number of HTTP requests that were being made, which massively reduced the round-trip time. To reduce the number of requests, use CSS sprites to call less images, minify and combine your JS and CSS files, and don’t call anything that you don’t need. One of my biggest gripes with WordPress is how plugins that are only needed on certain pages, such as Disqus, or Contact Form 7, tend to be called on every single page, which creates unnecessary requests. Reducing the number of unnecessary requests will reduce your RTTs. A sprite is one big image that contains all of your images. They look similar to those sticker sets you used to get with one hundred stickers on a single sheet. Using CSS you can ‘hide’ everything in the image except for a section between a set of co-ordinates. CSS sprites work because it’s faster to load one big image and use CSS to show the section you want than it is to load lots of smaller images. This is because the browser doesn’t need to make as many requests. The fastest way to use CSS sprites is to use SpriteMe, which is a tool that enables you to easily turn all of your images into a CSS sprite. With mobile Internet usage expected to take over desktop usage in 12 months time, it’s never been as important as it is right now to fix your site speed. Internet users are less tolerant of slow websites than they’ve ever been, and the shift towards Internet-enabled mobile devices means that if you’re not fast, you’re not going to be seen. Hi Marcus, good article with a lot of useful tips! One thing that you missed is that you should not scale images. The image at the top of your article is 2048×1152 px but you scale it to 610x343px. That’s 1.2 MB overhead for your readers. I’ve re-uploaded a 610×343 version, which is a bit more inline with the advice given in the post! Glad you’ve found the post useful, hope all is well. The article was really helpful and in-depth. You have included so many important points that affect page speed times. Thank You for this article I’ll bookmark it for sure and keep using it now and then. Really very helpful. Thanks for the post Marcus. Very beautifully you have explained all the points one by one, I have bookmarked this post for future reference. Keep posting like this awesome articles. Hi Marcus, Thanks for writing this article. I was really struggling to speed up my page loading time. I was using Google Adsense through which I was managing my revenue. But for that I was using Ezoic nameserver which was slowing my webpage loading time. So, I have already stopped that. Now, I am searching to improve my page speed. I have found your article really helpful. While reading your article, I have implemented the tricks that you have mentioned and I have good good results so far. My page loading time is getting improved. Thanks for your help. Thank You! I am very fortunate I got this article. You know, the load time of my website page is 10.17s and page size is 3.1MB which is very much high and that was the reason my website takes time to load. But fortunately I got the solution here. I will definitely going to follow your tips. Marcus ! this is really great information, that every blogger and every web developer should know. Page speed is very important for a site. Great thoughts here we have already implemented many of these! Great tips to improving website speed. loading speed will help us in improving our SERP’s rankings so i am going to follow your steps. Thanks for the great tips. Gzip compression, expire headers and images hotlinking are some very easy wins you can achieve almost instantly. Awesome content! Agree with you Page load time matters more than grade. Website performance optimization ca be done by adding CDN(Content Delivery Network), Minimizing HTTPS, Optimizing images etc. We brought our site load time from 5 sec to 0.4 sec.